SO WHAT ARE WE SEEING? – After having spent the last nine months surviving cancer, I’ve decided that the last thing I’m going to do is allow the incoming Trump presidential administration to do me in. After all, I’ve lived through Richard Nixon, Ronald Reagan, George H. W. Bush, and George W. Bush, and those five took us from ultimate government corruption to the country being bankrupt. Now we potentially have all that in the next Republican president. C’mon, we’re black folk, so we’re used to troubled times and folks hatin’ on us. We always knew it would be no time soon that racism would be buried once and for all, and in fact also always knew that it could get worse. The man hasn’t even taken the oath of office yet, and already we have a glimmer of an idea as to how chaotic and corrupt his four years in the White House are going to be, assuming he lasts that long. By that, I mean that Trump is likely to be impeached, because we all know how much respect for the law and the Constitution he has (can you say “NONE” boys and girls?). Just look at the public backbiting and infighting happening within his transition team already. Look at some of his appointments – some people with absolutely no clue with how government is supposed to work, and others, like former NY Mayor Rudy Giuliani, who believe war against people of color isn’t “hell”, but home. Rudy wants to be our US secretary of State. Probably wants to carry a gun on the job too! Trump has a billionaire who will serve as US commerce secretary. This is like allowing a lion to run the meat locker. Can we really trust a man who will see his main job as attracting foreign business for himself and his boss? And how about the lady Trump appointed to head up the US Education Dept.? Hear she has absolutely no educational experience at all, unless you call working to actually destroy public schools as a “worthy” goal? But the king of them all, obviously, is Donald J. Trump, the man many in the white nationalist movement have poured blessings on ever since his earth-shaking election several weeks ago. If fact, at last reports, a whole bunch of Ku Klux Klanners are scheduled to march and rally somewhere in North Carolina to celebrate Trump’s victory this Saturday. Has he tweeted a message to this people to find something else to march and make noise about? Of course not, and we all know how much that man loves to tweet. What’s real promising is that major media across the nation are gearing up to following President Trump’s every move, every misstep. We cab all feel how he’s gearing up to turn the federal government into a great big personal piggy bank. I’ll be amazed if he doesn’t plant a big ole’ “TRUMP” sign on the White House with plenty of casino parking. You know, maybe I’m wrong. Maybe the kind of dishonesty and corruption that is coming is a type we’ve never seen before. Well if it is, I can honestly say that I’m ready. I wonder if I can say the same thing for the racists who put Donald Trump in the Oval Office in the first place! The proud Eagle Nation of North Carolina Central University continues in deep mourning for the loss of its leader last Saturday, Chancellor Debra Saunders-White. Dr. Saunders-White, 59, died November 26th after a courageous battle with kidney cancer, which she was diagnosed with in 2015. She took a medical leave last August. The eleventh chancellor in NCCU’s history, Saunders-White came to the school on June 1, 2013. Ms. Avon Ruffin, former member of the NCCU Trustee Board until 2015, served as vice-chair of the Search Committee, and remembers how impressed the panel was with her commitment to educational excellence. A native of Hampton, Va., Dr. Saunders-White earned her bachelor’s degree in history in 1979 from the University of Virginia, and a master’s in business administration from The College of William and Mary in 1993. In 2004, Saunders-White earned a doctorate in higher education administration from George Washington University. In addition to her academic credentials, Saunders-White spent 15 years in the corporate sector, working at IBM in 1979 a systems engineer, rising to marketing and management before she left. She later taught college preparatory math in Newport, R.I. 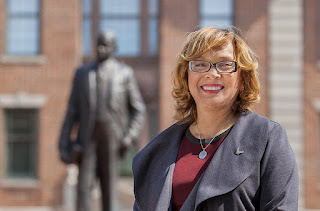 In 1999, Saunders-White became provost for technology at Hampton University, and in 2006 she went to UNC-Wilmington to become vice chancellor of information technology systems. While there, Dr. Saunders-White improved emergency communications for campus safety and cost effective classroom technologies. May of 2011 saw Dr. Saunders-White accept an appointment by the Obama Administration to serve as Deputy Assistant Secretary for Higher Education Programs (HEP) , administering more than 60 programs totaling nearly $3 billion annually. In February 2015, she was chosen to become the first permanent female chancellor in NCCU’s history, assuming the post in June of that year. “Chancellor Saunders-White will be sorely missed, but her legacy will not be forgotten." A memorial service was held on the NCCU campus Monday evening, followed by a candlelight vigil with students, faculty and administrators. In her honor, a ‘Celebration of Life Tribute’ will be held on Friday, Dec. 2 at 2 p.m. in NCCU’s McDougald-McLendon Arena. Saunders-White’s funeral is scheduled for Saturday, Dec. 3 at 11 a.m. at St. Joseph’s Catholic Church (414 Buckroe Avenue, Hampton, Virginia 23664) in Virginia. If state lawmakers insert themselves into deciding North Carolina’s next governor, or changing the state Supreme Court to nullify Justice-elect Mike Morgan’s victory, there will be mass demonstrations and civil disobedience, promises NCNAACP President Rev. William Barber. Rev. Barber joined the ranks of those concern that the Republican majority in the Nc General Assembly would appoint two new justices to the state’s High Court in order to offset the 4-3 Democratic majority Morgan’s Election Day victory resulted in. Thus far, GOP legislative leaders claim that they haven’t discussed it with their caucuses. Barber’s warning comes as the State Board of Elections posted new unofficial number tallies in the gubernatorial race between Republican incumbent Gov. Pat McCrory, and his Democratic challenger state Atty. Gen. Roy Cooper. With all but 13 counties reporting in, Cooper leads McCrory by 9, 716 votes of 4.7 million cast, what some observers are saying is an insurmountable lead for the governor to overcome despite his legal action demanding a statewide recount, and specifically a recount of over 90,000 ballots in Durham County which were tabulated hours after polls closed on Nov. 8th because of mechanical problems. McCrory wants those Durham ballots recounted by hand, but the Durham Elections Board previously rejected his campaign’s petition. At press time, the state Board of Elections was scheduled Wednesday to decide whether to order the Durham Board to proceed with the recount. Meanwhile, the conservative Civitas Institute has filed a federal lawsuit, which will be heard in court on Dec. 8th, seeking to stop any certification of early voting ballots from same-day registrations, claiming that the addresses on those registrations were not confirmed before the ballots were cast. During his remarks at the Moral Monday demonstration, Rev. Barber blasted what he saw was a deliberate manipulation of the election process by Republicans to deny communities of color their voting rights. He said NCNAACP lawyers would be in court Friday to challenge the Civitas lawsuit. Barber also demanded that Gov. McCrory stop his attorneys from interfering with the post-election vote canvassing process with their many challenges and, thus far, “bogus allegations” of voter fraud. “Pledge that after the canvass and recount, you will not try to get the legislature to take steps to unconstitutionally decide the governor’s race,” Rev. Barber added, noting that if the final margin of victory for Roy Cooper is below 10,000 votes, state law allows the Republican-led legislature to decide who the next governor will be. Rev. Barber also warned that he expects the NC General Assembly to follow the ruling of the US Fourth Circuit of Appeals to redraw the congressional and legislative voting lines when it reconvenes in January. Several months ago, the federal court found the 2011 district maps unconstitutional because black voters were “stacked and packed” into “minority” districts solely because of race. [CHARLOTTE] The Charlotte-Mecklenburg County district attorney announced Wednesday that the police officer who fatally shot Keith Lamont Scott last Sept. 20th was legally justified in shooting the black man because Scott brandished a gun and refused to obey orders to drop it. Scott died at the scene. DA R. Andrew Murray told reporters Wednesday that Scott had taken medication right before he was killed. Undercover officers saw Scott with marijuana and a gun in his vehicle before deciding to approach him. Scott’s killing set off several days of demonstrations and violence in Charlotte. [BELHAVEN] A judge has issued a 10-day temporary restraining order preventing the demolition of Pungo District Hospital in Beaufort County, according to Mayor Adam O’Neal. Seven members of the Pantego Creek LLC, the nonprofit group that currently owns the hospital, filed suit claiming that they were misled by managers of the group to have the facility torn down. Vidant Health closed the hospital in 2014, claiming that it was losing money. The Belhaven town board and various community groups have sought to purchase the building and reopen it as a health facility. [RALEIGH] At press time Wednesday, there is still no word on the time or location the Loyal White Knights of the Ku Klux Klan plan to hold their victory march and rally this Saturday, Dec. 3rd. The sponsoring KKK chapter is from Pelham, NC, a small unincorporated community in Caswell County near the Virginia border, 45 minutes north of Burlington. The group’s website is calling the event “Victory Klavalkade Klan Parade – Trump’s race united my people.” In August 2014, the group sponsored a rally against illegal immigration in Troy in Montgomery County. [ASHEVILLE] A 20-year old Morganton man has pleaded guilty in federal court to planning an ISIS-inspired terrorist attack in either North Carolina or Virginia. Justin Nojan Sullivan now faces a maximum penalty of life in prison. Authorities say Sullivan tried to purchase an assault weapon with hollow-point ammo for using in a mass murder at a concert or nightclub. An undercover FBI agent was solicited to build a silencer for the gun. Sullivan wanted his parents killd after hos mother found the silencer.